Having spend quite a while wandering the forum looking for ideas and inspiration, I have now made a start on a layout of my own. The main inspiration came from "Makers Mark Distillery" (http://gn15.info/forum/viewtopic.php?t=6313) with a bit of "Upton Whent"
As you may spot from the image above and from the name, there will be a certain amount of fantasy with references to Terry Pratchett's Discworld books including the Nac Mac Feegles and at least one swamp dragon. Last edited by backwaterscotland on Tue Mar 03, 2015 7:26 pm, edited 3 times in total. On top there is a 1/8" sheet of cork as a base. 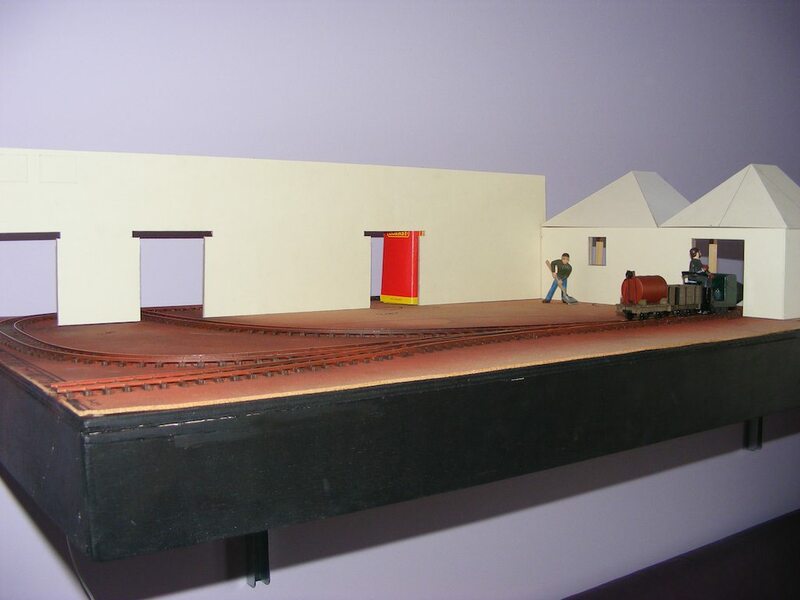 Trackplan is simple, an inglenook with the central siding looped around to the make a circle. The track to the front is taken to the board edge to allow for an extension to be added later. All track in Peco 0-16.5 Code 100. 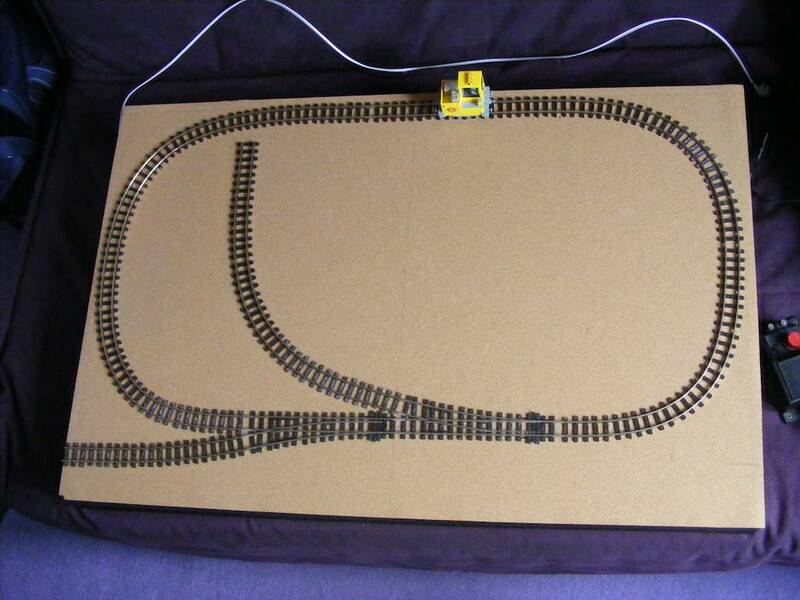 Current progress is that the track is laid, the point motors installed (but not yet wired) and the basic wiring to the track installed and tested. Next up will be designing the buildings and building some stock. Im in the process of planning my very first Gn15 layout aswell Andy. So ill be following your progress all the way. Nice bit of woodwork there Andy. My one concern looking at the track, is how close it is to the edges at either end. 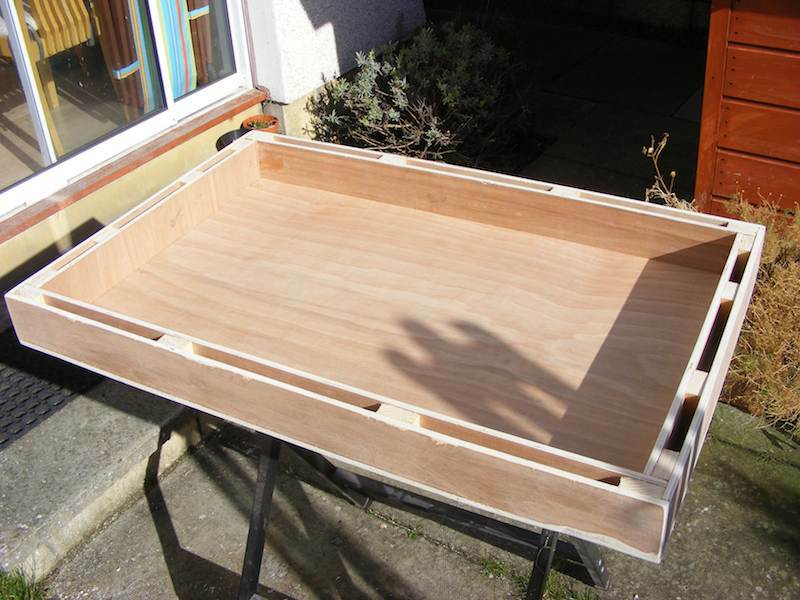 If the ends are going to be open, any knocks of the table/stand at an exhibition could send your stock to the floor. If you plan to have walls at the ends, I'm not sure you have left enough clearance, it looks like it will be a bit tight. Thought it worth mentioning before you go any further. Steve Bennett wrote: Nice bit of woodwork there Andy. The track on the left has now been made into a tighter radius which gives me my 10mm clearance (as there will be a wall & gate on that side), the one on the right only has about 5mm but I'll live with that as it will be inside a building. Safe bet, closest track centreline to any edge of the baseboard should be 100mm, or 4 inches. Check out Haywards Estate in Gn15.info Layout Tours... explains all. Track is now painted - sprayed with red oxide then matt black and the sleepers painted by hand with a suitable brown acrylic paint. Started to mock the buildings up to get a feel for the sizes and shapes. 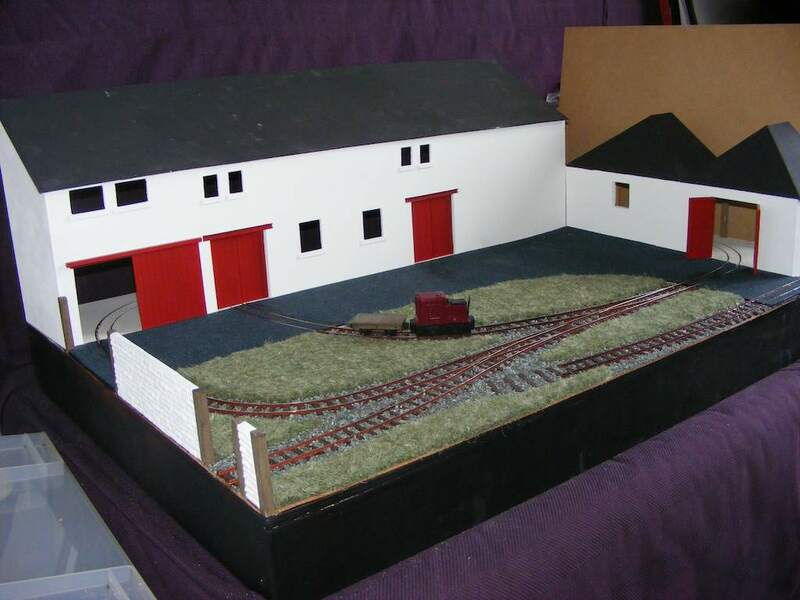 The buildings are based on Edradour distillery (Scotland's smallest distillery - http://www.edradour.com). One error on the mockup is that the buildings on the right should have sloped roofs rather than a flat end. Although the mockups are in foam board, I will use artists mounting board for the real buildings with a stripwood internal frame. I like the distillery idea, nice distinctive buildings with their pagoda thingummies. (Nice produce too generally ). Photographed at Edradour 3 years back. Revell do a Trabant in 1/24th which would suit although I was thinking about a Landrover instead. 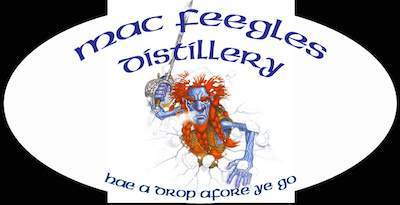 Can you post some piccies of the real distillery? Do you have anymore info on the Talisker line? There is a good set of photos here : http://www.fife.50megs.com/Tour%20Edradour%20Distillery%20Scotland/index.htm - I'd like to get a run up to the distillery to take some photos but time isn't there. Unfortunately, the linked page above is all that's I've found on the talisker tramway. Ahhh, this was bound to happen sooner or later, wasn't it? I always thought the slogans 'The dram wi' a slam' and 'A big drop fo' wee jocks' quite appropriate! Today I settled down to start on the buildings. The main building has had the front cut from some 3mm thick card rescued from the back of a bookcase but that is as far as progress got with that. 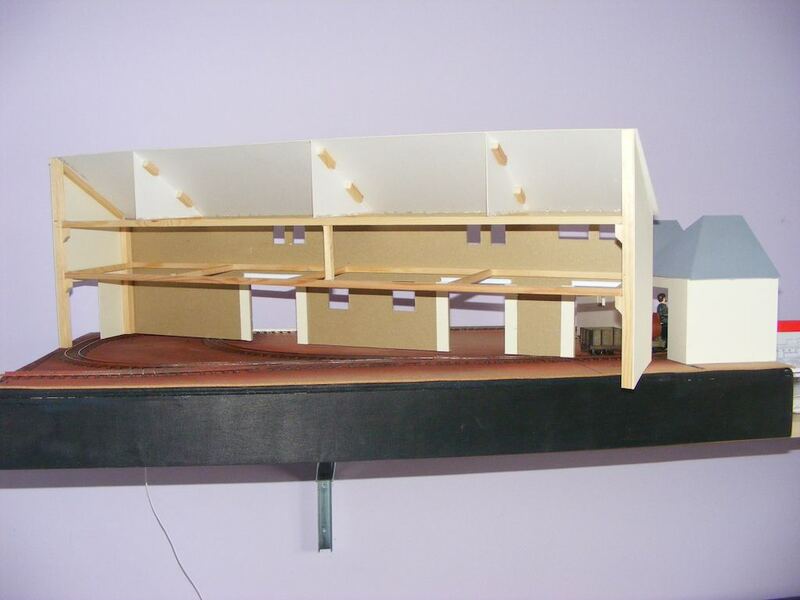 The smaller building has been constructed from artist mounting board and stripwood with the door and window cutouts being made thicker with some offcuts from the 3mm card as the original building had very thick walls. The roof's did give me a bit of a headache, resorting to maths, trigonometry and bits of paper to work out the sizes and angles. These have been assembled but not yet attached. I didn't think the board looked very big in the early photos. But now you see it with buildings and people for reference it is actually a good size. You have made a good start and I'm sure you are going to turn it into a nice layout. Main building construction - 3mm card for the front, artist mounting board for the rest. 6.3mm plastruct U-section above the doors and 5mm wide card strips added under the windows as ledges. Didn't quite get the building square but I don't think anyone will notice. Internal frame is 12mm and 8mm stripwood - there will be a floor installed in the future but not until the windows and doors are installed. 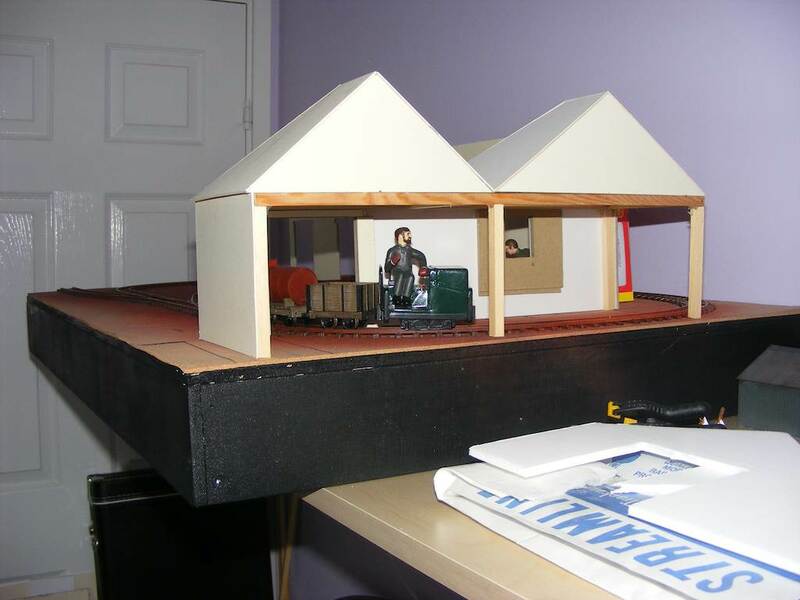 The roofs on the small building will be slate but the main building will the corrugated material as per the real one. Plus I'm working on a couple of Gnomy-based tippers. All of the buildings have had mounting board "concrete" installed where it would be visible - this has taken quite a while as fitting the card around the tracks is fiddly and needs to be precise. Doors have been made and painted - shown temporarily fitted. 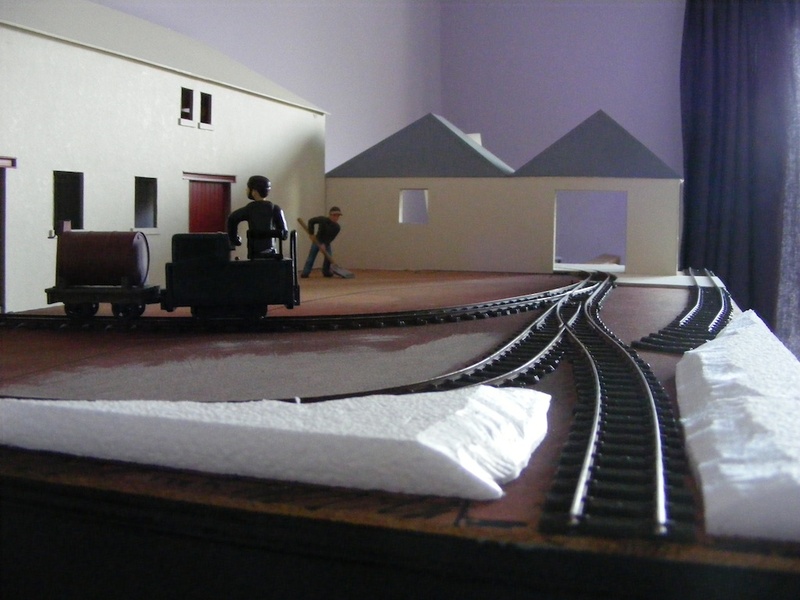 Beginnings of the scenics have begun - the plan is for a tarmac/gravel road from back left to the front right while the tracks will have low grassed areas around them. I've also added a disconnected line at the front which will be heavily overgrown to suggest that the line originally went further into the distillery but has been cut back. 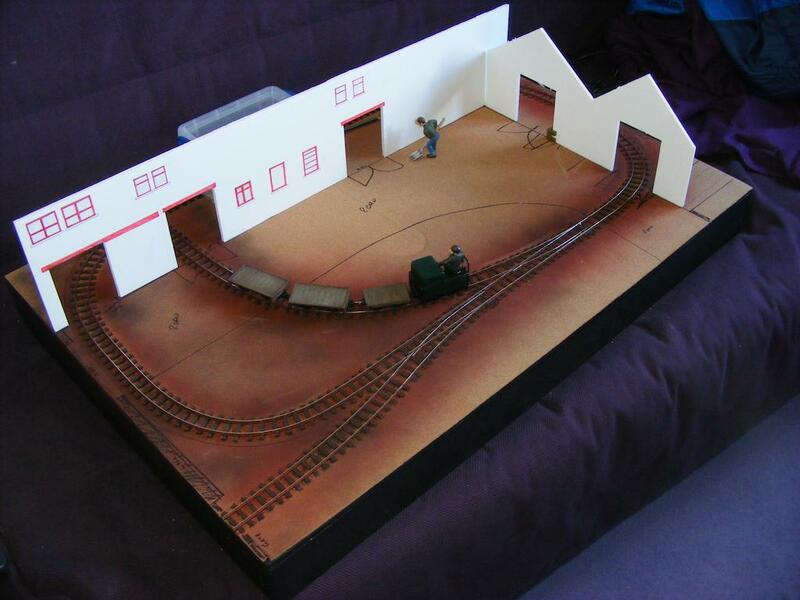 The roadway has been built up using black mounting board but this will need some weathering and toning down. The styrofoam/polystyrene has gone as it was too tall and looked wrong. I had bought some hanging basket liner last week and the previous pack I used was a couple of mm thick but the new lot I bought is about 8mm thick so I've removed the polystyrene and replaced it with the liner. On top of this I'll use some static grass. The roadway has been completed with a top coat of "road grey" materials to give a rough gravel/tarmac look. The main building has been painted, glued into position and the doors glued on. The smaller building has been painted and is awaiting the doors and window to be glued on. 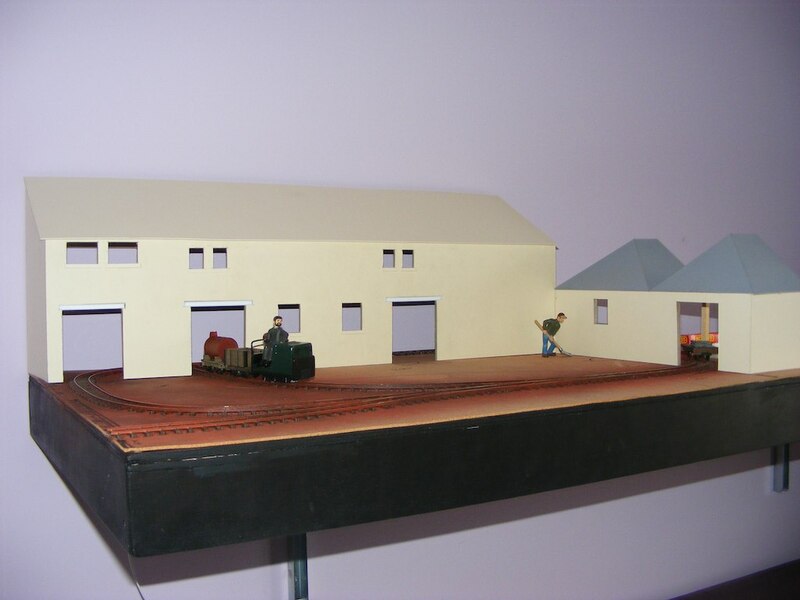 A delivery of 1/24th scale slates has been delivered so slating will start shortly. 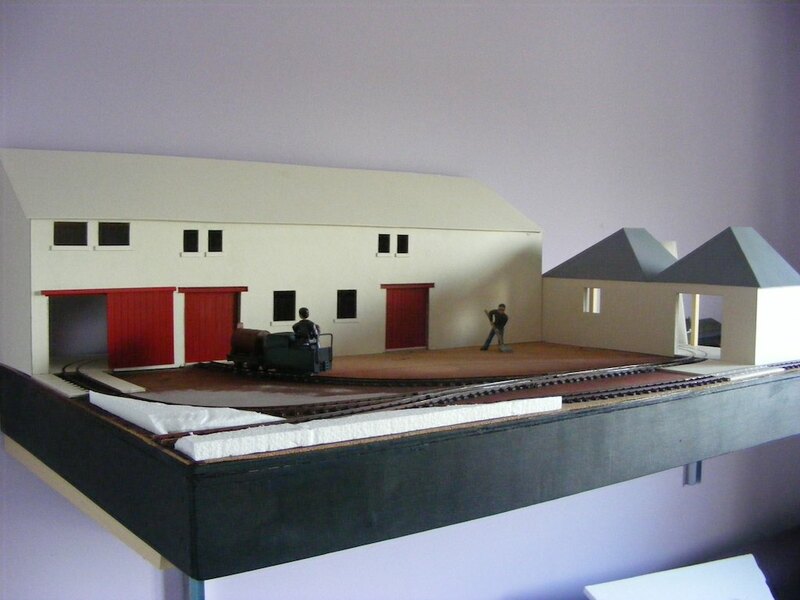 The left hand end of the layout has progressed as well with the installation of walls (modified stonecast items by Ten Commandments) and gate posts (8mm stripwood painted and weathered). Gates are still to be made though. Its looking really good Andy. 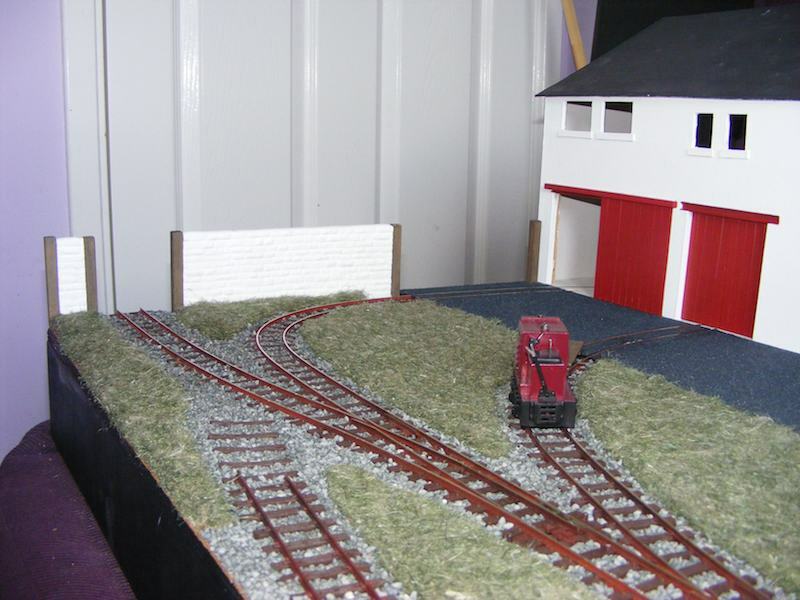 You might wish to try glueing a few little grass tufts into the track at the front to make it look a little more disused. Glen A wrote: Its looking really good Andy. I've still got a lot of the scenics to complete including improving the grass with some 6mm static grass at which point I'll add some tufts and some dandelions. Really coming together well Andy and I really like the way that despite a lot of buildings, you still have lots of space outside to create the scene.